Google rolls out the new Photos application currently for Android and iOS currently which breaks the app away from the company's social networking service Google+ without cutting the connection completely. While apps are being rolled out as we speak, the new web interface links to apps only currently but will later on provide you with access to all of your photos on the web (update it is live now). 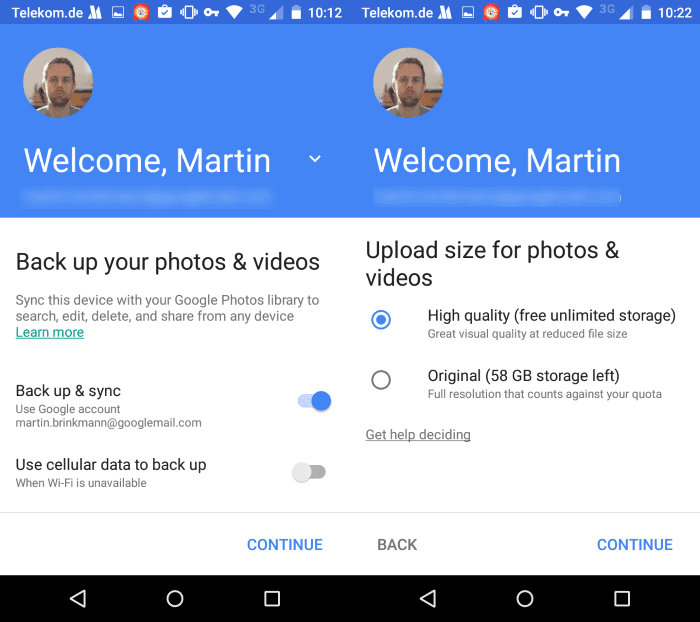 Google Photos supports two different storage size options. The first, dubbed high quality, offers free unlimited storage for photos that are 16 megapixels or less. A similar offer is available for videos of a resolution of 1080p or lower. The original mode on the other hand is limited to the account's storage limit instead. The app displays a series of screens on Android when you first run it to set it up properly. On the first screen, you are asked whether you want to back up photos and videos, and whether you want that to happen over WiFi only or cellular as well. The next screen displays the two storage size options. If you select high-quality, compressed versions of the photos and videos are stored by Google that don't count against the account quota. Basically, if your camera shoots 16 megapixel photos or lower resolution photos, you may want to select high quality as it makes virtually no difference in regards to quality but does not count against your quota. The same is true for recorded videos if the device records them at 1080p or lower. Pinch to zoom in the app. Press and hold to swipe. One of the cooler features of the app is its search functionality that provides you with easy options to use descriptive search terms such as dogs, people or cars to display only matching photos in the photo browser. The application ships with basic enhancement and editing options. To use them tap on a photo and then on the edit button when a preview is displayed in the interface. Other features that may be of interest are integrated sharing options supporting first and third party services including Hangouts, Twitter and WhatsApp. To share multiple photos, simple tap and hold the first photo and move the finger or pen afterwards using one swift operation to select other photos displayed on the screen. You may create special sharing links this way that recipients can access without having to log in first to do so. Simple select "get shareable link" in the share menu to create a new link. The link itself shares a unique url on photos.google.com that anyone can access without log in. The share url is protected by a long random string. The shared page itself displays thumbnails of all photos, a download button to save them all in one go to the local system as a zipped archive, and an option to delete the link if you are the creator of the shared page. You may also browse photos on the page using a simple image viewer that is provided on it. 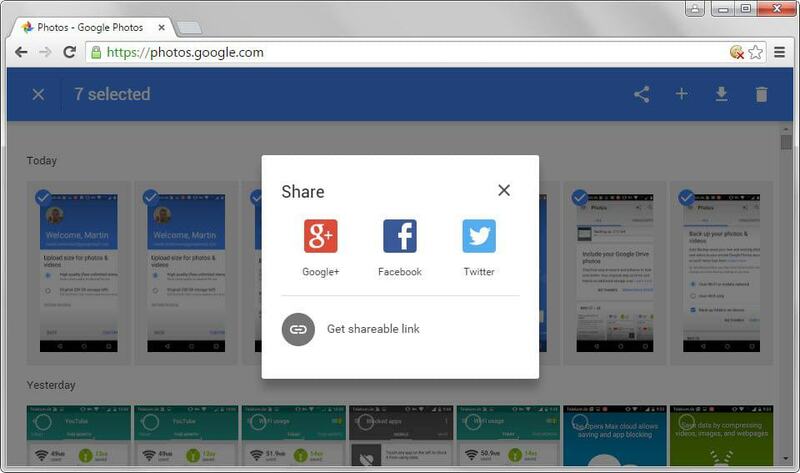 Google Photos users who share links get an overview of everything they have shared on the https://photos.google.com/shared page. You may use the page to copy links again and to delete photo groups that you have created shared links for previously. The new Photos application does not reinvent the wheel but it improves the previous version of the app in several ways. Unlimited storage is without doubt a major upgrade which improves the applications competitiveness and appeal. Companies like Amazon have introduced unlimited online storage for photos recently (for Prime members) while others like Flickr have increased free storage to 1 Terabyte. While Google's offer many not appeal to professional photographers or video creators, it provides most users with worry-free unlimited photo and video backup options that are accessible via applications but also on the web. Now You: Have you tried the new photos app or web service already? What's your take on it? 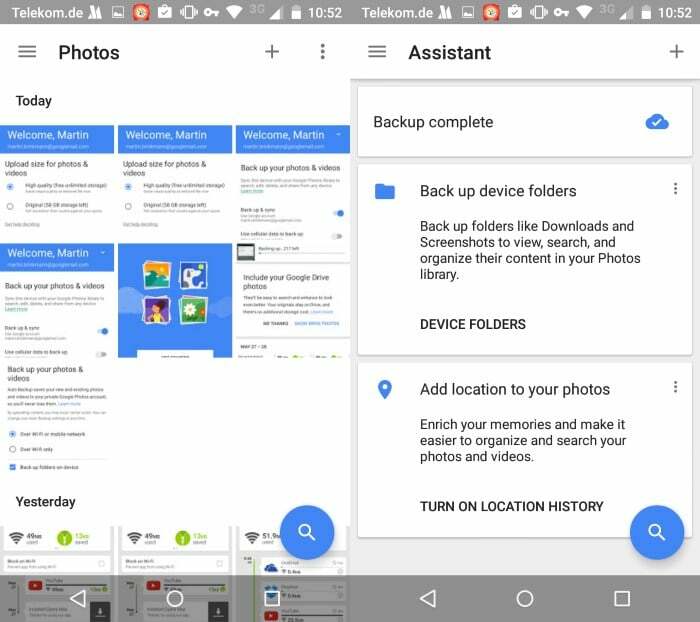 Google's new Photos app and web service introduces unlimited photo and video storage among other things. Yes! Finally! I can remove Google+ now. I have been waiting for the backup capabilities to be moved from G+.